She may have lost her crown to newer rivals, but the former Sovereign of the Seas now offers a royal welcome for much less than a queen’s ransom. Spring had not sprung on the French Riviera. Café chairs stood in stacks, shops stayed shut and a chilly breeze whipped along the waterfront. Awaiting her first cruise-ship arrival of the season, Villefranche resembled nothing more than a sulky supermodel, woken too early from her beauty sleep. But Sovereign, at least, looked the part. At 74,000 tons she is big enough to impress but not overwhelm, while her sharply raked prow and cutaway stern lend her an elegance that today’s floating hotels can only dream of. Yet this was the megaship of her day. Her debut in January of 1988, as Royal Caribbean’s Sovereign of the Seas, was a sensation, firing the starting gun in the race for space that continues to this day. So pleased were Royal Caribbean with their new flagship that they ordered a pair of almost identical sisters, Monarch and the Majesty of the Seas, and for many years this trio offered the most spectacular sight on the world’s oceans. As times and fashions changed, the ships were updated to keep pace. 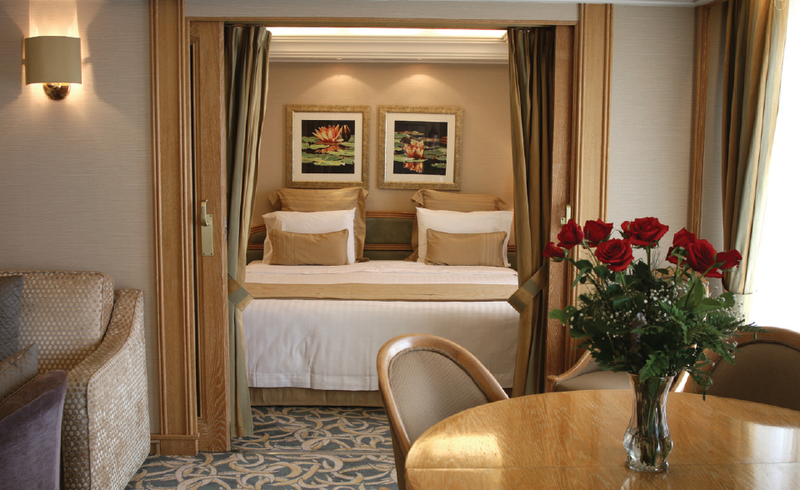 But their small cabins and lack of balconies eventually told against them, and in 2009 Sovereign of the Seas was passed to Pullmantur, then the Spanish subsidiary of Royal Caribbean, to serve the European market. Today the ship sails simply as Sovereign, her hull repainted in smart dark blue, but anyone who knew her in the Eighties will find much that looks familiar. Panoramic glass elevators – the first in any cruise ship – still glide up and down inside a five-storey atrium of glittering brass, glass and marble (another first, endlessly copied by rivals). This remains the beating heart of the ship, dividing her private and public spaces. 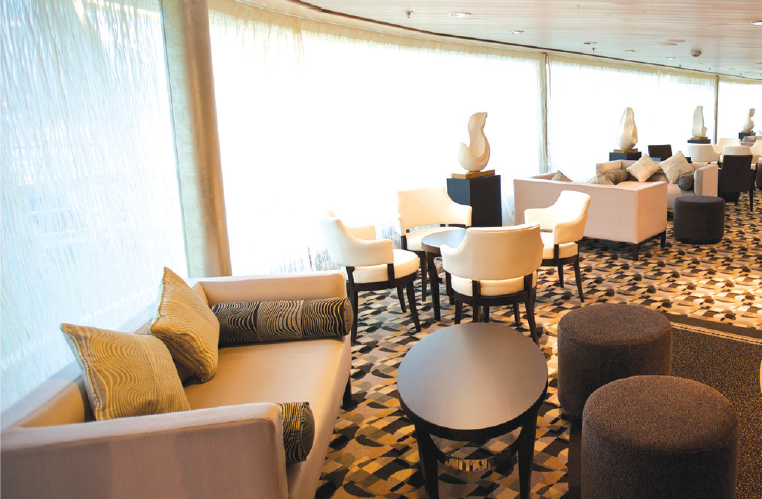 Forward are the cabins; aft is the main run of lounges, bars and restaurants, rising up to the outdoor decks. At the level of Deck Seven, a full promenade still encircles the ship. The cabins remain very small, at around 122 square feet each, and aside from windows the inside and outside rooms are very similar. Each has a TV, just enough storage for a very casual cruise wardrobe, and a tiny shower/loo (containing one generic shampoo dispenser, so take your own favourite toiletries). “Adequate” would be the kind way to describe them. Royal Caribbean retro-fitted a string of balcony suites some years ago and these are more spacious, if a tad spartan by current standards. 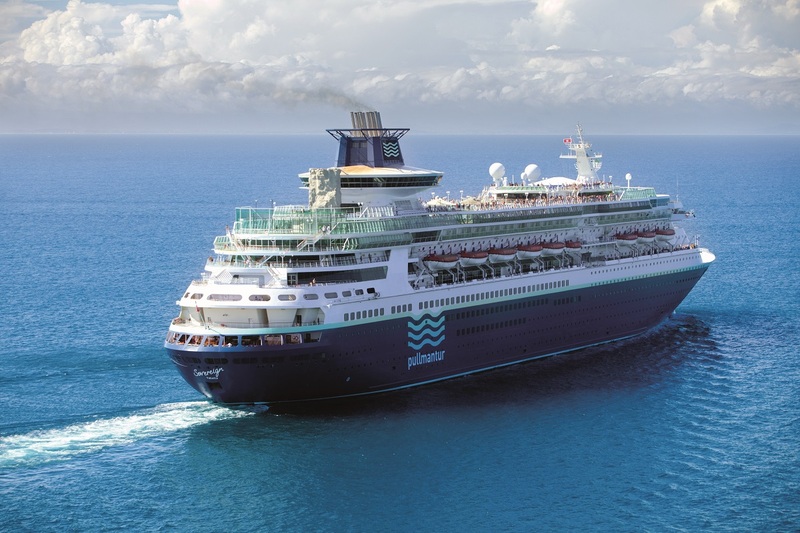 But Pullmantur does not pretend that Sovereign is a luxury product. Instead, what you get is value. 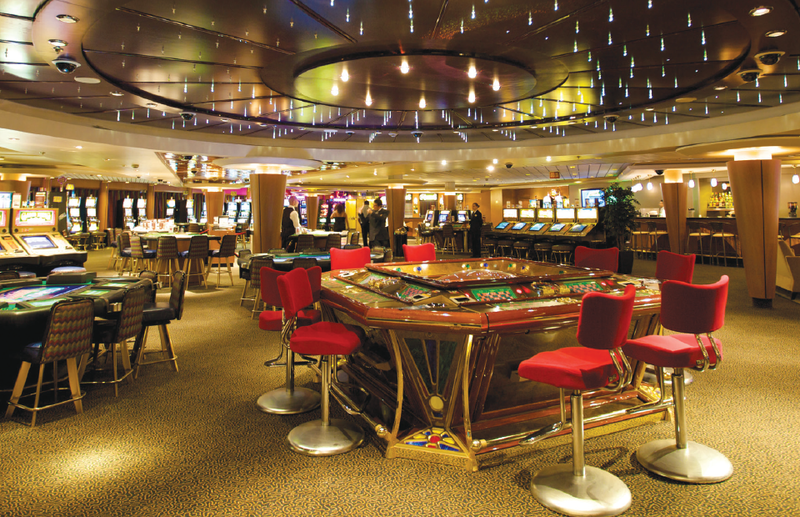 Fares are exceptionally modest (a week’s cruise this summer for under £500); drinks are included, and gratuities, which work out at a little over 10 euros a day, are paid at the end of the cruise. The passenger complement is mainly Spanish but announcements, menus and onboard literature are also in English. Food is decent rather than exotic, served in two main dining rooms that operate on a double seating rotation for dinner (in line with the Spanish habit of eating late, the second sitting does not begin until after 9pm). The upper deck Panorama Buffet is open for all main meals, and although breakfast and lunch can be something of a crush, dinner buffets were much more relaxed during my short trip. There is also an outdoor pizzeria that usually opens from lunchtime until early evening, and an extra-tariff à la carte venue called Wu Fusion, offering Asian specialities. The latter seemed very quiet, though I daresay it will fi ll up as Sovereign begins her regular seven-night Mediterranean runs. Service was hard-working but a little overwhelmed at times, suggesting that Pullmantur may need to recruit more stewards. But there were plenty of nice touches too. In the public rooms each table bore the picture and the name of the server on duty, and these were changed with every shift. And when I found that my in-room charger was useless, one of the crew borrowed my camera and charged it for me himself. The Spanish seem to travel in large, sociable groups, stripping neighbouring tables of empty chairs to accommodate their extended families. For those travelling in couples or smaller groups, this can be a little irritating. Iberian overload sometimes affected the crew, too. On tendering at Villefranche, the entertainment officer made announcements only in Spanish and, though this was obviously just an oversight, it was frustrating at the time. But there were also moments of sheer bliss. Listening to a live Brazilian duo in the Spinnaker Bar was a sublime after-dinner treat, and sipping cava at sunset in the Viking Crown Lounge, 14 decks up and now restyled as Bar 360, remains as elegant an experience as ever. Would I sail with Sovereign again? Yes, if I could stretch to a suite. But however you travel, the value for money is outstanding.